Oncology Informatics: Using Health Information Technology to Improve Processes and Outcomes in Cancer Care encapsulates National Cancer Institute-collected evidence into a format that is optimally useful for hospital planners, physicians, researcher, and informaticians alike as they collectively strive to accelerate progress against cancer using informatics tools. This book is a formational guide for turning clinical systems into engines of discovery as well as a translational guide for moving evidence into practice. It meets recommendations from the National Academies of Science to "reorient the research portfolio" toward providing greater "cognitive support for physicians, patients, and their caregivers" to "improve patient outcomes." Data from systems studies have suggested that oncology and primary care systems are prone to errors of omission, which can lead to fatal consequences downstream. By infusing the best science across disciplines, this book creates new environments of "Smart and Connected Health." 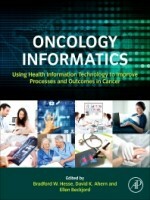 Oncology Informatics is also a policy guide in an era of extensive reform in healthcare settings, including new incentives for healthcare providers to demonstrate "meaningful use" of these technologies to improve system safety, engage patients, ensure continuity of care, enable population health, and protect privacy. Oncology Informatics acknowledges this extraordinary turn of events and offers practical guidance for meeting meaningful use requirements in the service of improved cancer care. Anyone who wishes to take full advantage of the health information revolution in oncology to accelerate successes against cancer will find the information in this book valuable.